Richard Ritter has been a photographer of the large format camera for over 25 years. A graduate of Hallmark School of Photography, he has developed a distinct perspective in photographing the land and its elements. His black and white images often focus on shapes and textures; small aspects of the natural environment offering unexpected contrasts and patterns which produce a mystical tension. Richard worked at Zone VI Studios with Fred Picker for 15 years. There, Richard was responsible for the design and construction of many fine photographic Zone VI products. It was during this period that Richard devoted time to the art of the large format camera and black and white printing. Ritter had the opportunity to seek the knowledge and guidance of Fred Picker and many of the leading photographers, photo educators and artists through the Zone VI Workshops and alumni of Hallmark. Richard has stated that he gained invaluable insight to the artistic approach of photography by working with and listening to the critical views of some of the key leaders in the field. 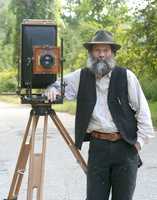 Richard lives in Townshend, Vermont, where he uses his skills as a master craftsman to repair large format cameras and restore cameras of historical importance along with conducting photographic workshops and photographing. He also designs and custom builds large format and ultra large format cameras. Commission by Brattleboro Museum photograph Alice Hollway . Commission by Brattleboro Museum to supply photos for "Technology & Art Become One"
Robert Flaherty Centennial Project Brattleboro Museum - Technical photographic support. To 1995 Zone VI Studios responsibility design, testing, technical support. Started working in the visual arts somewhere around the age of 2 or 3 years old.